We managed to go to two sets of fireworks this year. Here is the best shot taken at Manchester, NH. Maybe next year I will actually use a small tripod, but it is hard to capture a moving target (by that I mean Adam, not the fireworks!). Here is the video footage of the fireworks as well. 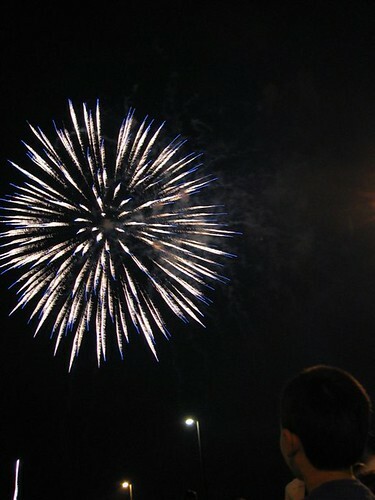 Apparently, Adam started smiling at a girl nearby and soon he was looking more at her than at the fireworks. I realized this afterwards, when I glanced over and found her smiling at him! I maxed out my camera memory so I only got part of the finale. Thankfully, a new 4GB card is on its way. Just to be complete, I added the video of the fireworks we saw at Devens on June 30. Like I said in the comment for this photo...I really do like this one a lot. It is a great shot of the firework itself...and the position and sharpness of your son looking so intently at the display really leads me to the subject. I only wish the computer I use all the time had a brighter display so I could see the detail a bit mroe...but that is my problem, not yours. The video is great to. Do you have video editing/splicing software? I assume this is a few clips cut and spliced...no? What software do you use? Yes you can arbitrarily put dates on posts. In fact, I often have drafts that are several months to a year old (or more), and if I forget to update the post to the current date and time, it will get posted to the archives, in which case I wonder what happened to it!! I would rather be authentic and post the actual date and time rather than back post it a few days. In the archives, it all comes through in July which is good enough. In terms of the splicing software, I simply use the Windows Movie Maker which comes with Windows XP (free is always a good price for me). It is simple to use and also compresses the large AVI files to WMA format. I guess the difference in philosophy between current and back dating might come from the very nature of what the poster thinks they are doing. Also....I've never even tried Movie Maker....I suspect I probably have more "tricks" within XP that I have not played with too.